Khamlia is located in the southeastern part of Morocco, 7 km south of Merzouga in the province of Errachida. The town has a population of 390 of Gnawa and Berber ethnic origin and it is located at the foot of the Erg Chebbi dunes, doors to the great Sahara desert. 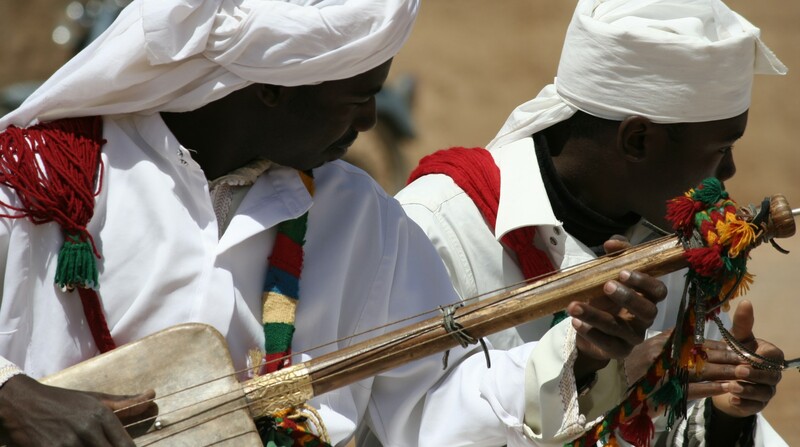 The Khamlia’s Gnawa originated in black Africa having a close and long standing relationship with the desert. Their ancestors were brought from central and west Africa as slaves, through the Sahara desert in caravans that arrived to the southeastern part of Morocco. After their emancipation from slavery, they survived as nomads moving regularly in search of favorable land for their herds. Around the 50s and 60s they started to settle down with the Berber nomads in towns or in the growing urban areas. That is the way Khamlia was founded. Since then the main sources of income are agriculture, livestock farming and lately also tourism. People are warm, kind and laid-back and due to their musical culture, their social customs and their traditions, they play a unique role in Morocco. Khamlia’s music, in the hands of the Gnawa tribe, is the essence of the place. The music is legendary from their ancestors, preserved from their original homeland and still played in a traditional manner. Khamlia invites you to enjoy its hospitality, to have a cup of tea and to listen to the Gnawa music, all while resting in an outstanding desert landscape, among the dunes and underneath a beautiful canopy of stars.